Teacher Gift Ideas have been on my mind lately since this special day is just around the corner. Today some of my favorite blogger friends and I are sharing on our blogs, 12 new Handmade Gift Ideas for Teachers! These projects, recipes, and printables were inspired by the wonderful teachers out there and our gratitude for all they do! I am a Mom X 4, and if I tell you the truth half of the time I’m running around late and trying to do 100 things at the same time. I wanted to make a gift that teachers would love and parents could put together in just a few minutes. 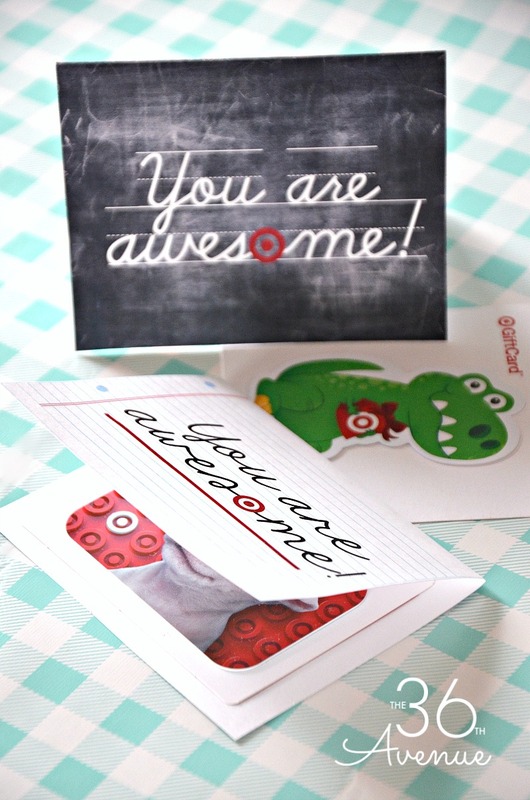 Next time you are at Target make sure to grab a gift card and then come back for these free gift card printables! 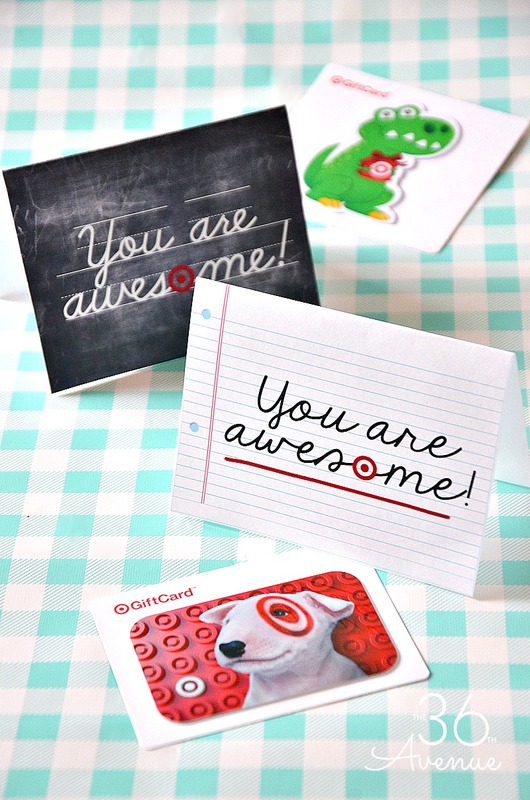 You want to pin these cute cards for later! I love that you can make this a group gift. If you have other moms that would like to participate, you can collect donations and then everyone can write their name inside! I know my kids’ teachers too many times have used their own money to decorate their classrooms, get extra supplies, and even treats for their classes. 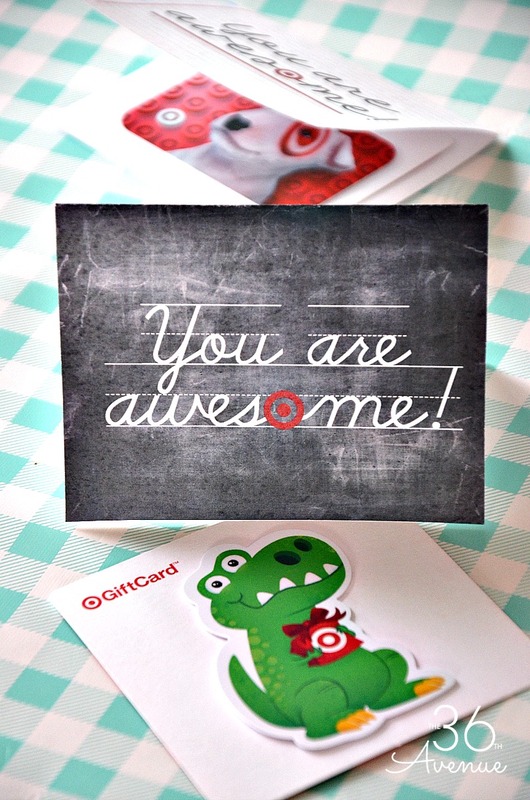 A gift card can be a great way to give back and show how much we appreciate all they do for our kiddos! Simply print the “You Are Awesome” gift cards at the end of the post, then cut them and fold them in half. You can use regular glue or glue dots to stick the Target Gift Card inside. Make sure your child and you take a few minutes to write something nice inside of the card and remind your child’s teacher that she or he is AWESOME! Love these ideas! I can’t wait for you to see more awesomeness! BLOGS:Thanks to The 36th Avenue, Somewhat Simple, The Crafting Chicks, Eighteen 25, Your Homebased Mom, Lolly Jane, A Pumpkin and a Princess, Mom On Time Out, Tatertots & Jello,Skip To My Lou, I Heart Naptime, and Smart School House for participating in this awesome Teacher Gift Ideas Blog Hop!I love these bloggers! Check out these teacher gift ideasI would love for you to meet my friends!Click on the links below to visit their blogs and check out these cute ideas! 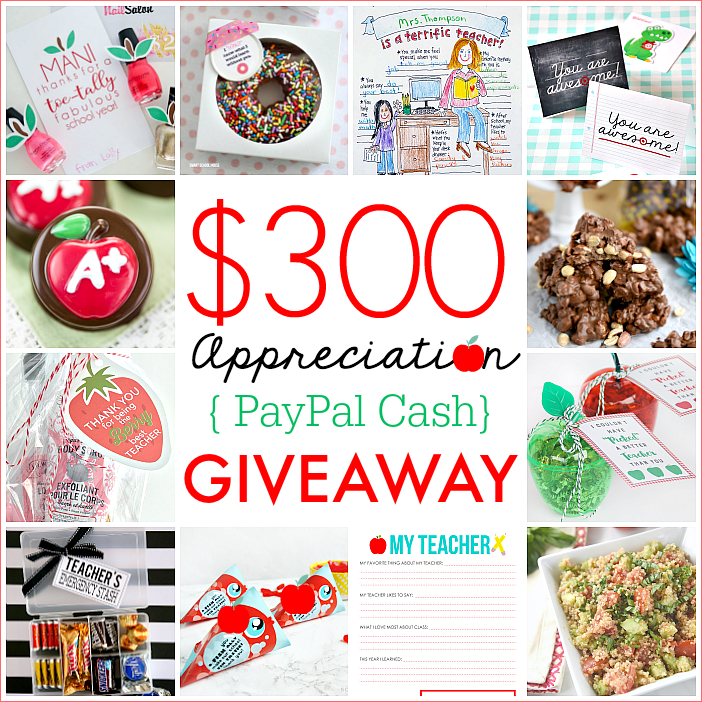 Don’t forget to enter to win our $300 PayPal Cash Giveaway! My favorite was my first grade teacher, Mrs Ledbetter. My favorite teacher was Mr. Wynnick.. I liked math..and he was our soccer coach also! Thanks for the great ideas! I have a really tough time thinking of gifts for my grandson’s male teachers! I’m so bad at giving the teacher’s gifts. I usually remember the same day and then I don’t have time to get them anything. But these ideas were great! My favorite teacher was my fourth grade teacher Mrs. Mayme Vest! She is no longer with us but lived to be 95 years old. She also was instrumental in getting our alumni association started & having a yearly reunion. She also wrote articles for our local newspaper about the history of the small town I grew up in. She always encouraged her students to follow their hearts & taught us that nothing is impossible.